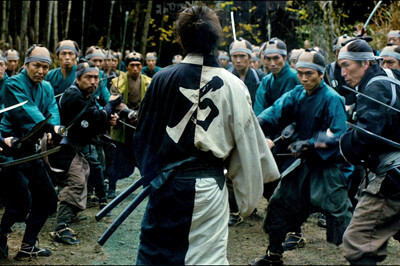 Magnolia/Magnet handled the gritty, period-bound aesthetics of 13 Assassins with beauty and restraint, and Blade of the Immortal's 2.35:1- framed, 1080p AVC treatment ends up being a continuation of that, though bursts of color add something different to the anticipated dour appearance. Granted, most of the film operates around earthen textures and colors, capturing Manji and Rin's journeys through the wilderness, along roads, and holed up in small ramshackle buildings, which amply pushes the disc's contrast and muted palette capabilities. Black levels are rich and absorbing, yet just light enough to emphasize details whether shrouded in shadows or taking place in the middle of night. The tans of natural wood and skin tones, the deep and rich greens of foliage, and the dark grays and blues of steel reveal tremendous color fluidity and gradation, all appropriately restrained to conform to Takashi Miike's intentions. A few vibrant elements emerge in the photography, though, such as the vivid red of blood and the bright purple of a dress, and those are beautifully saturated alongside those darker elements, popping without seeming out of place. Details of weathered metal and scarred skin and tremendously defined, and there's no perceptible distortion or other issues in the digital transfer. Blade of the Immortal lands all the right blows on Blu-ray. There's a surprising amount of activity going on in the Japanese 5.1 DTS-HD Master Audio track as well, as not just during the expected upticks in vigor during large battles. Granted, those sound fantastic and comprise the most noteworthy elements of the track: the clanging of blades and shuffling of bodies, whether it's a large brawl or a one-on-one duel, sprawl across the surround channels with frequency and intensity. Splintered boards and other crashes tap into rich lower-frequency activity, but stay elevated and clean against the activity's presence in the front channels, while stabbing sounds and the gurgling of blood are not-so-subtle exercises of the track's exceptional clarity. The more restrained elements, such as the movement of feet on hardwood floors during sparring sessions or the trickling of fluid, are well-pronounced and natural. Dialogue is perhaps most impressive of all, settling into the center channel with exceptional responsiveness to the front channels and to the intended surround environment, working in lower-end bass and strong midrange oomph. There are bursts of action and subdued stretches, and both are handled with skill by Magnet's track. The Japanese subtitles are grammatically sound and legible, but are awfully close to the English dub track for comfort, so keep that in mind. Stock press-kit footage and interviews accompany the Blu-ray release of Blade of the Immortal, led by Man vs. 300 (18:24, 16x9 HD), which gathers together almost twenty minutes of behind-the-scenes material that offers a glimpse at Takashi Miike's orchestration of a larger-budget samurai film. A few off-camera interview spurts break up the footage, but it's mostly just a raw glimpse at the components that went into crafting the huge brawl at the very end of the film. A long, yet basic series of Cast Interviews (56:10, 16x9 HD) focuses on Hanu Sugisaki (Rin), Kagehisa Anotsu (leader of the Itto-ryu), Hayato Ichihari (Shira), Erika Toda (purple-dress assassin), and several others, while one lengthy stretches dedicated directly to an Interview with Takuya Kimura (28:44, 16x9 HD) … with a guest appearance from Takashi Miike and additional focus on production elements later in the discussion. Magnolia/Magnet have also included a Poster Gallery and a pair of Trailers. The fantasy-laced premise of Blade of the Immortal may immediately set it apart from Takashi Miike's other historical samurai epics, but the visual language and intensity made it look like the director could be crafting something just as dramatically rich and … plausible, within reason, as those. Indeed, it seems as if the director might want for his tale of an immortal, self-healing swordsman to be taken more seriously than not, as the attitude often revolves around a grim and grueling attitude involving a young girl's desired vengeance for the slaughter of her family, who were killed by a near-mythical band of warriors every bit the match for the hero. 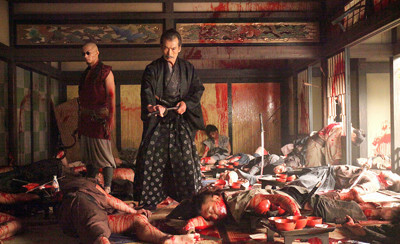 The execution leans in another direction, though, as Takashi Miike's often excessive violence takes hold in admittedly rather engaging duels, while the questionable and shifting logistics of Manji's supernatural powers gradually bleed the earnestness of the concept out. It's entertaining enough to mildly Recommend the package, especially Magnet's Blu-ray, but it's certainly lacking the sharpness of Miike's prior samurai outings.